Preheat the oven to fan 180C/ conventional 200C/gas 6. Season the chicken with salt and freshly ground black pepper, then coat lightly in a little of the flour. 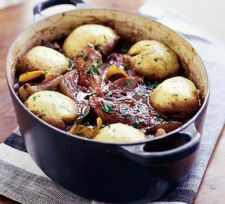 Heat the oil in a large ovenproof lidded casserole dish and, in batches, brown the chicken on both sides over a high heat. Remove the chicken and set aside. Reduce the heat, add the onions and lardons and cook for about 5-8 minutes so they are golden tinged. Add the garlic, then sprinkle in the plain flour and cook for 1 minute, stirring to prevent sticking. Add the mushrooms, bay leaves, redcurrant sauce and orange zest, then pour in the red wine and stock and season with salt and pepper. Bring to the boil, then return the chicken to the casserole dish, making sure it is well covered with the liquid. Put on the lid and cook in the oven for 30 minutes. While the casserole is cooking, prepare the dumplings. Put the self raising flour, breadcrumbs, mustard and butter in a food processor and blitz to a crumb consistency. Add the thyme, parsley, eggs and salt and pepper. Briefly blitz until the mixture forms a fairly moist dough. Using floured hands, roll the dough into 6 large, even-sized balls. Remove the casserole from the oven when the 30 minutes is up and sit the dumplings on top. Pop the lid back on and return to the oven for a further 20 minutes, until the casserole is cooked and the dumplings have puffed up. Spoon the chicken and sauce onto six plates and top each with a dumpling. Serve with a rich, fruity red wine.